Do you have a minute to spare to learn some English? 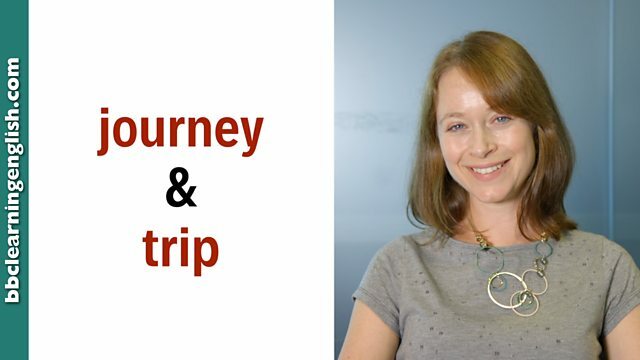 Sian explains why we use journey and trip. Give us 60 seconds and we'll give you the English! Hi! Sian here again! Now, we all love going on holiday, but these two words can cause problems. So a journey is a noun and refers to a single piece of travel - so, when you move from one place to another by car, plane, train, bus. The journey to London takes three hours by bus. A trip is also a noun, but usually refers to more than one journey and the time you spend in a place. So, if someone asks 'How was your trip?' they're asking about the whole time you are away, not the journey. How was your camping trip, Sian? It was fun, but it rained all weekend! A trip is often quite short compared to a holiday, and we can use it in these set phrases. So you can have a business trip, a school trip or a day trip. Journey is a noun. It refers to a single piece of travel i.e. one period of movement from one place to another by car, plane, train etc. The journey to London takes three hours by bus. Before the car, journeys used to take much longer. It's been a long journey but we're finally here! Trip is a noun. It usually refers to more than one journey and the time spent somewhere. If you travel for a day to a hotel, stay three days and travel for one day home again, then your trip was five days. It's been quite the trip, but I'm glad to be home. Next week, I'm going on a short trip to France. I'll be away for six days. Trip is also often used in several set phrases: a business trip, a school trip and a day trip. Mr Johnson is away on a business trip in Germany. Can I take a message? Please get your permission slips signed if you want to come on the school trip to the zoo. Shall we take a day trip to the beach today? Are we talking about 'one piece of travel' or 'several pieces of travel and time spent staying somewhere'? Choose the correct word to complete this sentence: The _______ from London to Edinburgh takes around 8 hours by car. Use the second sentence to understand what the person means by 'journey' or 'trip'. Which of these seems unlikely to be a regular trip that people take? Which of these is not a common set phrase with 'trip'?